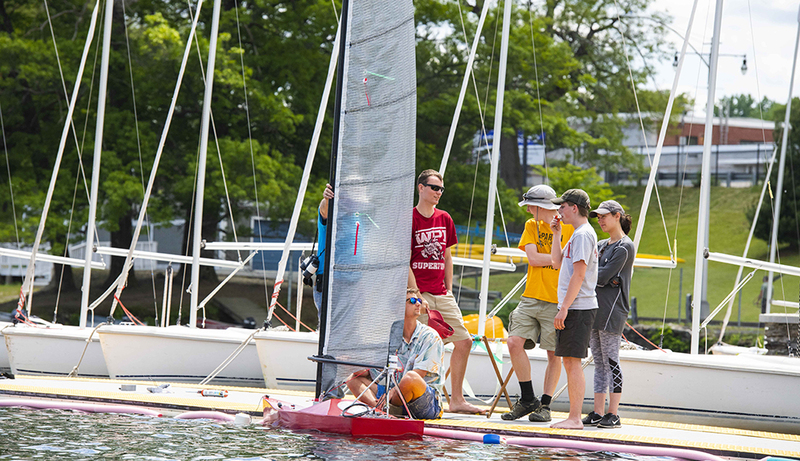 For the second year in a row, WPI took home top honors in last week’s International Robotic Sailing Competition SailBot 2018. With a total of 43.4 points (a second-place entry from Maryland’s Broadneck High School garnered 34.6 points), WPI’s SailBot team came in first in three of the five challenges it scored in and second place in the other two, says Ken Stafford, co-advisor to the WPI team, avid sailor, and professor of robotics engineering. WPI’s win caps off a year of intense work on the team’s vessel and robotic operations. A combination of instinct, intuition, and knowledge helps sailors navigate through all kinds of unpredictable conditions. Roboticists, on the other hand, rely on extensive computations and calculations to make their robots move. SailBot requires both skill sets to maneuver unmanned boats through a series of races and challenges. The competitors in the 12th annual event, held this year from June 11 to 15, hail from all over North America. Teams put their vessels through the paces of both remote-controlled and autonomous races to bring home the coveted trophy. The name of the game at SailBot is unpredictability. “You are at the whim of what Mother Nature’s going to throw at you every day,” says William Michalson, professor of electrical and computer engineering and one of the faculty advisors to WPI’s SailBot entry. And while the boat is designed to withstand up to 2-foot seas and 20-knot winds, they would rather not have to. This is WPI’s third year of participating and last year’s team came in first in SailBot 2017 in Annapolis, Md. Because of that win, WPI hosted this year’s event at Regatta Point Community Sailing at Lake Quinsigamond. Team members can operate the boat remotely from shore, but in many events, the boat operates autonomously. “The complexity of this project forced us to go beyond what we learned in class,” says Hans Johnson. SailBot includes races that pit teams against their own personal times and others where teams compete to win. Other matches include fleet races; a station-keeping challenge; precision navigation tests; payload, collision, avoidance, search tests; and an hours-long endurance challenge. Open to those from secondary schools, undergraduate programs, and graduate programs, and to individuals and company teams, this year’s teams were from North America, but previous years’ competitors have come from as far away as Wales and Brazil.